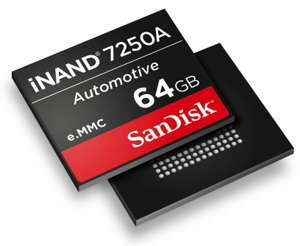 Leveraging enhanced flash storage technology for reliability, the SanDisk-branded storage device is designed to support data demands of the latest 'advanced driver-assistance systems' (ADAS), infotainment and safety systems, and other connected technologies in vehicles. It delivers dependable performance in extreme conditions in and around the vehicle, including ambient temperatures down to -40°C and up to 105°C. This makes the EFD for a range of connected automotive systems and environments. "The shift beyond simple connected automotive applications, such as infotainment, to ADAS and autonomous systems, is spurring rapid growth in the volume and velocity of data on our roadways, as well as the need for more resilient and intelligent storage solutions to manage it," said Christopher Bergey, VP, embedded and integrated solutions, WDC. "By utilizing enhanced, enterprise storage and controller technology, our new iNAND 7250A embedded storage device offers the outstanding reliability and quality that is essential for the automotive industry, smart features that our customers want most and exceptional performance over a wide range of temperatures. It's well-suited for everything from 3D mapping and vehicle-to-vehicle communications to the high thermal temperatures that can be generated by autonomous driving computing devices and systems in the car." The number of vehicles with 'connected' systems continues to rise, as does the volume of data generated that must be managed. The iNAND 7250A is designed to work with a variety of automotive systems in the vehicle that generate, receive and process data, from increasingly complex infotainment and navigation systems, to diagnostic systems continuously processing analytics, to constantly streaming vehicle-to-vehicle and vehicle-to-infrastructure systems. It also comes with the company's suite of automotive 'smart' features, which include enhanced power failure protection, a comprehensive memory health status monitor, advanced diagnostic tools and more. Samples of the iNAND 7250A EFD are available. This device joins the company's family of solutions for the automotive industry, including SanDisk brand automotive grade SD and EFD solutions.